Boomerang Bags is a community driven initiative tackling plastic pollution at the grassroots level. 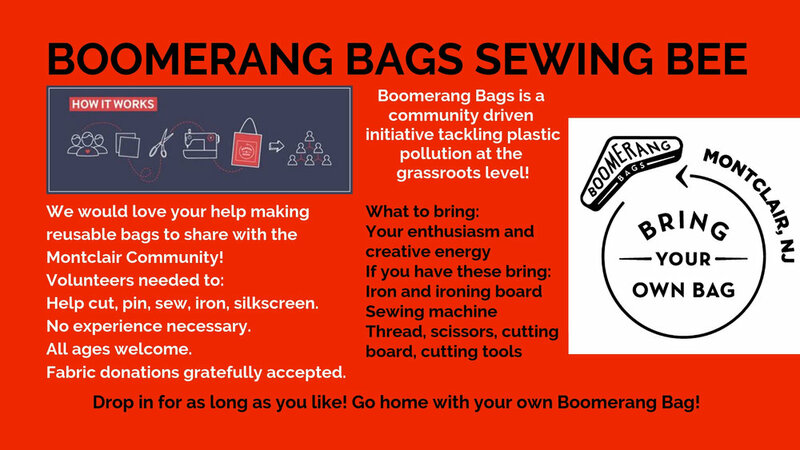 Montclair is a designated Boomerang Bags community and we are seeking volunteers to make reusable Boomerang Bags, help spread the word, donate material, and give us encouragement! Our first Sewing Bee will be on Sunday, 11/25, from 10am to 1pm at The Creativity Caravan, located at 28 S. Fullerton Ave. in Montclair. Drop in for as long as you like! This event is free. No sewing experience necessary and all ages are welcome. If you don’t sew there are plenty of other tasks to help with. If you do sew, great! And if you can bring your sewing machine or serger, even better! Also needed are irons, ironing boards, thread, cutting boards, cutting tools, scissors, pins, and fabric donations. Everyone is welcome, no matter what you can contribute! Everyone will get to take home a Boomerang Bag as a thank you for volunteering! The bags we make will be shared with the Montclair community as a contribution toward fostering sustainable practices and reducing plastic bag use. By the community, for the community! This project is being organized by the Montclair Creative Reuse group. Would your business like to have Boomerang Bags available for your customers? Contact us to make that happen!